Well, we believe celebrities deserve some measure of privacy. But some things do strike us as a little strange. Like, getting secretly married and not showing any outward signs of what has to be a huge change in your life. 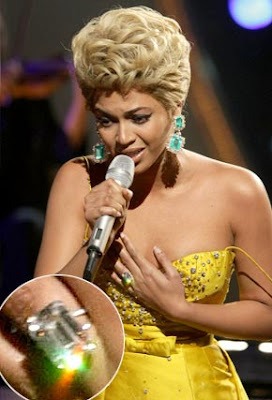 Beyonce is now showing off her wedding ring, months after her nuptials took place. The singer wore the Lorraine Schwartz stunner at Conde Nast's Fashion Rocks event in NYC Friday night. According to US Magazine the ring features an 18-carat flawless diamond set in platinum. Jay-Z said earlier this year "privacy" was the reason he didn't want to confirm their wedding, which took place back in April at his New York City apartment. Jay-Z reportedly debuted his wedding ring back in July. I wish I could see the wedding photos.